Sharifian, Z., Maghsoudi Mood, A., Mohamadi, N. (2014). Effect of different ratios of municipal solid waste compost on growth parameters and yield of Marigold (Calendula officinalis Moench.) and Daisy (Bellis Perennis L.).. International Journal of Advanced Biological and Biomedical Research, 2(1), 43-50. Zakaria Sharifian; Ali Akbar Maghsoudi Mood; Neda Mohamadi. "Effect of different ratios of municipal solid waste compost on growth parameters and yield of Marigold (Calendula officinalis Moench.) and Daisy (Bellis Perennis L.).". International Journal of Advanced Biological and Biomedical Research, 2, 1, 2014, 43-50. Sharifian, Z., Maghsoudi Mood, A., Mohamadi, N. (2014). 'Effect of different ratios of municipal solid waste compost on growth parameters and yield of Marigold (Calendula officinalis Moench.) and Daisy (Bellis Perennis L.). 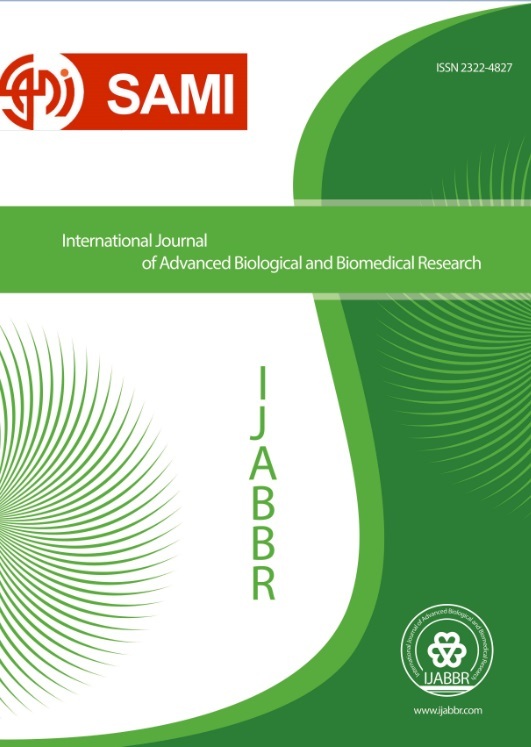 ', International Journal of Advanced Biological and Biomedical Research, 2(1), pp. 43-50. Sharifian, Z., Maghsoudi Mood, A., Mohamadi, N. Effect of different ratios of municipal solid waste compost on growth parameters and yield of Marigold (Calendula officinalis Moench.) and Daisy (Bellis Perennis L.).. International Journal of Advanced Biological and Biomedical Research, 2014; 2(1): 43-50. In a country like Iran, where soil organic matter is less than 1% and in most cases even less than 0.5 %, Municipal solid waste (MSW) is a permanent and inexpensive source of organic matter. Various experiments have indicated that applications of compost improve plant health, yield and nutritional quality. However, the quality of the compost determines the growth and the development of plants. The purpose of this study was evaluating the effect of different ratio of organic compost from urban waste on the growth of two Ornamental plants, Marigold (Calendula officinalis Monch.) and Daisy (Bellis Perennis L.). Five treatments (potting-mixes) were used, soil (Clay, Silt and sand with 1:1:1 ratios) (as a control),the soil with 25% compost, the soil with 50% compost, the soil with 75% compost and 100% compost. Fresh and dry-weight of shoots and roots, plant height, and chlorophyll content were measured. The results of this study confirm the beneficial treatment to improve the growth parameters is 25% and 50% compost in alendula officinalis and 25%compost in Bellis perennis. Al-Dahmani, J.H., Abbasi, P.A., Miller, S.A., Hoitink, H.A.J. (2003). Suppression of bacterial spot of tomato with foliar sprays of compost extracts under greenhouse and field conditions. Plant Dis. 87: 913–919. Alvarenga, P., Palma, P., Goncalves, A. P., Fernandes, R. M., Cunha-Queda, A. C., Duarte, E., allini, G., (2007). Evaluation of chemical and ecotoxicological characteristics of biodegradable organic residues for application to agricultural land. Environment International. 33(4): 505-513. Bhattacharyya, P., Chakrabarti, K., Chakraborty, A. (2003). Effect of MSW compost on microbiological and biochemical soil quality indicators. Compost Sci. Util. 11 (3): 220–227. Brady, N., Weil, R. (1996). The Nature and Properties of Soils, 12th ed. Prentice, New Jersey, USA, 385, 495. Cisar, J. L., and Snyder, G. H. (1992). Sod production on a solid-waste compost over plastic. Hortscience., 27 (3): 219-222. Davidson, H., Mecklenburg, R., Peterson, C. (1994). Nursery Management: Administration and Culture, 3rd Ed. Prentice Hall, Englewood Cliffs, New Jersey (AN), 486. Espinoza, L.A. (1997). Fate of nitrogen and metals following organic waste applications to some Florida soils. Flórida: Tese (Doutorado), University of Florida. 73 p.
He, X., Logan, T., Traina, S. (1995). Physical and chemical characteristics of selected U.S. municipal solid waste composts. J. Environ. Qual. 24, 543–552. Hernando, S., Lobo, M., Polo, A. (1989). Effect of the application of municipal refuse compost on the physical and chemical properties of soil. Sci. Total Environ. 81/82, 589–596. Lichtenthaler, H. K. (1987). Chlorophyll and carotenoids: pigments of photosynthetic biomembranes. Method in Enzymology. 148: 350-382. Lima,J.S., de Queiroz, J.E.G., Freitas, H.B. (2004). Effect of selected and non-selected urban waste compost on the initial growth of corn. Resources, Conservation and Recycling 42: 309–315. Otten, L. (2001). Wet–dry composting of organic municipal solid waste:current status in Canada. Can. J. Civil Eng. 28 (Suppl. 1), 124–130. Pant, A.P, Radovich, T, Hue N.V, Paull RE. (2012). Biochemical properties of compost tea associated with compost quality and effects on pak choi growth. Scientia Horticulturae 148: 138–146. Perucci, P., (1990). Effect of the addition of municipal soild-waste compost on microbial biomass and enzyme activities in soil. Biol. Fertil. Soils 10: 221–226. Ramadass K; Palaniyandi S.( 2007). Effect of enriched municipal solid waste compost application on soil available macronutrients in the rice field. Archives of Agronomy and Soil Science. 53(5): 497 – 506. Wilson SB, Mecca LK, Stoffella PJ, Graetz DA. (2004). Using compost for container production of ornamental hammock species native to Florida. Native Plants Journal, 5(2):186–194. Wilson, S.B., P.J. Stoffella, and L.A. Krumfolz. (2001). Containerized perennials make good use of compost. BioCyle. 42:59-61. Zucconi, F., Pera, A., Forte, M., DeBertolli, M. (1981). Evaluating toxicity of immature compost. Biocycle. 22: 54–57.